Home prices in La Grange are continuing to rise as we enter the summer selling season. This is good news for sellers but means the bidding wars will continue for most buyers. As you can see from the graph below, the news that the La Grange market is recovering has reached most sellers who are now listing their homes for sale at higher prices. Sellers should price their homes near market value if they expect to get a quick offer from a serious buyer. If you are considering buying a home in La Grange there are still some deals out there if you work with a Realtor who is familiar with the local market. Don't wait on the sidelines too long as the increase of interest rates and rising prices are combining to make homes less affordable. If you are interested in searching the current inventory of homes for sale in La Grange, IL you can find that information by clicking on the link. The number of active listings in La Grange increased by 8.1% from the previous month. Visit my website to search for homes for sale in La Grange or to be notified when La Grange homes come on the market. To find out what your home is worth in the current market email me or call me at 773-343-6375. The Villa Venice Condos are conveniently located about a mile south of downtown La Grange and only minutes from the I-55 expressway. This peaceful community consists of 2 bedroom and 1 bath units that are approximately 1000 square feet. The assesments are approximately $300 per month and include heat, water, garbage, exterior maintenance, lawn care, and snow removal. Your assesments also will give you access to Villa Venice's private swimming pool. Villa Venice condos are FHA approved and can be purchased for as little as 3.5% down payment. This is a perfect opportunity for first-time homebuyers in La Grange as well as homeowners looking to down-size. Downtown La Grange was voted the #1 downtown district in the suburbs by Chicago Magazine. It is home to some of the best restaurants and shopping in the area. Nicksons Eatery, Q BBQ, and Prasino are some of the most popular new restaurants in La Grange. If you prefer something more low-key The Hotdog Companyis a great place to grab a hot dog or a burger. La Grange is also one of the most commuter-friendly suburbs. The La Grange Metra can get you to downtown Chicago in about 30 minutes. 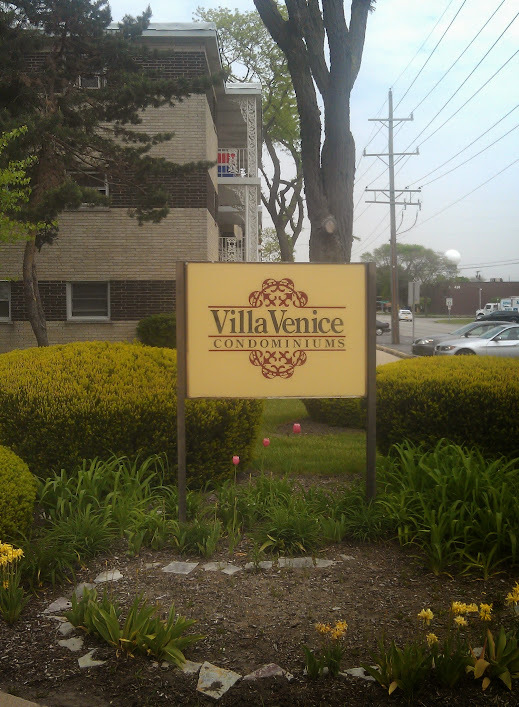 Villa Venice condos are located in the Lyons Township High School district. Lyons Township is ranked a 10 out of 10 by greatschools.com. Seventh Avenue Elementary School is also one of the most highly ranked elementary schools in the area. What's My Villa Venice Condo Worth? The real estate market is constantly moving. Contact me today for a free, up to date market analysis of your Villa Venice condo or to begin your search for a new home. The real estate market in La Grange, IL is continuing to climb upwards as the inventory of distressed properties is disappearing from the local market. Buyers are realizing that their window to purchase a home near the bottom of the market is closing quickly. The lower inventory and increased demand are working together to drive median home prices up more quickly than anyone expected. It is an excellent time to list your La Grange home for sale. A well-priced home should attract a quick offer in this market. However, there are still deals out there for a buyer who is not afraid to negotiate aggressively. It is more important now than ever to work with an experienced Realtor who is an expert in the La Grange market. The median list price in May for single family homes for sale in La Grange, IL is $459,900. The list prices increased by 4.54% from the previous month. The price per square foot for listings in the La Grange area is $209. The median number of days active homes for sale in La Grange have been listed is 47. This is significantly shorter than the national average. The percent of unoccupied properties is very low in La Grange. It is -8.6% below the national average. The percent of owner occupied properties in La Grange is 12.63% above the national average. Visit my website to search for homes for sale in La Grange, IL or to be notified when La Grange homes come on the market. To find out what you La Grange home is worth email me or call me at 773-343-6375. Sign up for monthly updates on the La Grange, IL real estate market. The Brookfield Terrace Condiminiums truly offer the best of both worlds! You can benefit from a suburban location that is less than 30 minutes from downtown Chicago and also walking distance to shops, restaurants, and nightlife. Brookfiled Terrace Condiminiums are exclusively 1 or 2 bedroom units with open layouts and high-end finishes. Residents love relaxing on their private balconies overlooking downtown Brookfield. Even though the building is right across the street from the Metra Station it is very well built and the train noise is minimal. Whether you are a daily commuter or empty nester, downtown Brookfield is a great place to live! Brookfield Terrace Condiminiums are located right next to Kiwanis Park which is home to little league baseball games all summer long. You will likely bump into your neighbors at Irish Times, a local pub and restaurant known for their pints of Guiness and fish and chips dinners. Phil's Sports Bar is also becoming a local legend. You will love Phil's tacos! What Schools Will My Kids Attend? Brookfield residents can take advantage of some very highly ranked schools, including S.E. Gross Middle School and Riverside Brookfield High School. Click here for more information about local school rankings in Brookfield. What's My Brookfield Condo Worth? The real estate market is constantly moving. Contact me today for a free, up to date market analysis of your Brookfield condo or to begin your search for a new home. The real estate market in Western Springs starting to heat up. After several years of falling or stagnant home values, the average selling price is finally starting to increase consistently. The average time a home spends on the market in Western Springs is only 47 days. This is significantly lower than the national average. This is a very positive sign that the local market will continue trending upwards for the immediate future. Sellers should expect a well-priced home to receive an offer in relatively short time frame. Buyers should be aware that the Western Springs real estate market is somewhat competitive and they should be prepared to make competitive offers. The median list price in April for single family homes in Western Springs is $647,450. The list prices dropped by -0.39% from the previous month. The price per square foot for listings in this area is $249. The median sale price in January forsingle family homes is $365,000. The sale prices dropped by -20.47% from the previous month. Visit my website to search homes for sale in Western Springs or to be notified when Western Springs homes come on the market. To find out what your Western Springs home is worth email me or call 773-343-6375. Like many other areas in the Western Suburbs, the market in La Grange Park is red hot! After several years of falling prices, the market is rebounding agressively and finally starting to appreciate. I feel that this is just the beginning and anticipate the market to continue to increase throughout the spring and summer seasons. Buyers who are on the fence should take this opportunity to ramp up their efforts and get serious about their home search. Well-priced homes are receiving multiple offers and selling much quicker than a few months ago. There are still deals out there but having an experienced agent who knows the market is a must! Potential sellers should be excited to see this data and will likely realize that now is an excellent time to list their home. The median list price in April for single family homes in La Grange Park is $294,000. The list prices increased by 13.95% from the previous month. The price per square foot for listings in this area is $193. The median sale price in January forsingle family homes is $443,000. The sale prices increased by 78.8% from the previous month. Visit my website to search for homes for sale in La Grange Park or to be notified when La Grange Park homes come on the market. To find out what your La Grange Park home is worth email me or call 773-343-6375.